So it’s been a bit quiet from me in December. December is a busy month for us all, but I got some painting done. I finished two things since I last posted, and to tell the truth I’m not really happy with either of them. In neither case do I think I’ve improved on my earlier work. Still, that’s not the end of the world and after a week or two of them sitting on my shelf I’ve decided to add them to the blog anyway. 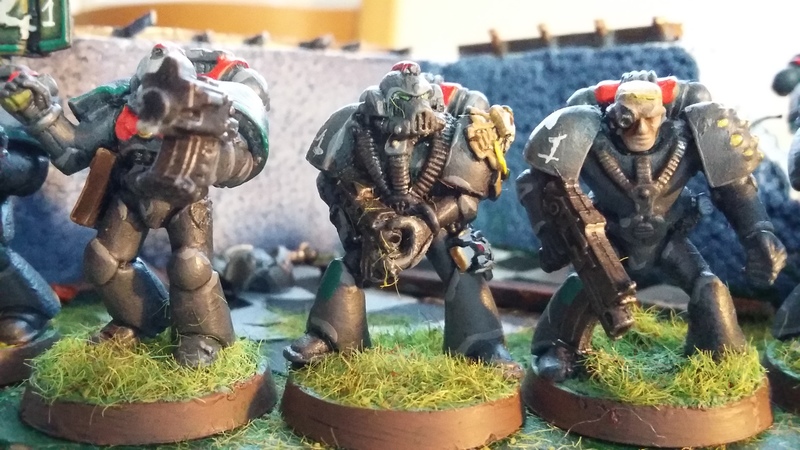 First up is another Steel Guard tactical squad. 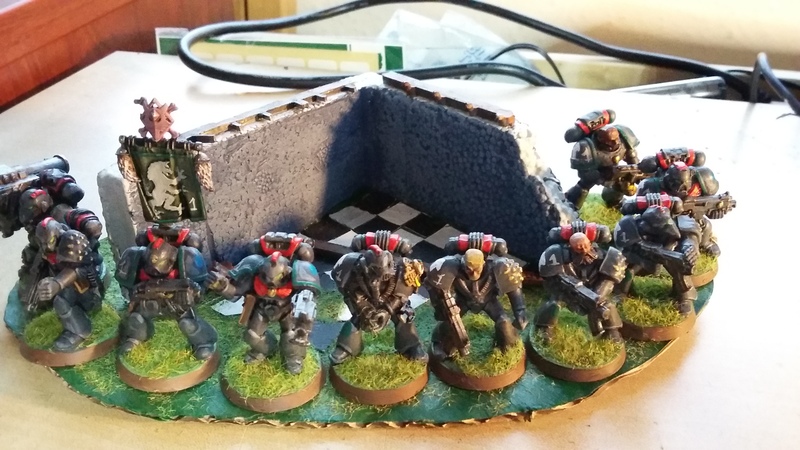 This is 4th Company I Tactical Squad. 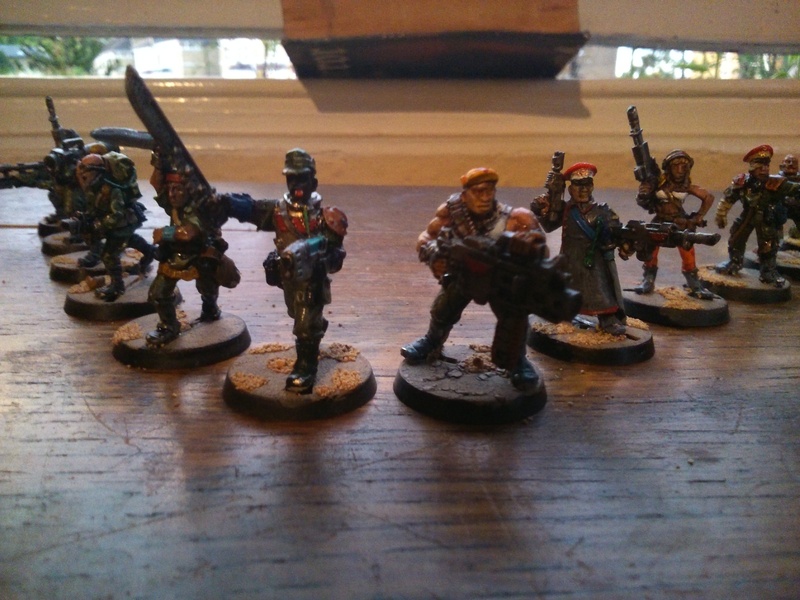 Led by Veteran Sergeant Sakhalin, a lovely Rogue Trader era mini, mostly this squad are old plastics. Sakhalin. Would you believe I didn’t notice those stray strands of grass when taking the photos! After reading a comments conversation on someone else’s blog, I painted the edges of the bases brown this time and I have to admit that I think this is the best way of basing I’ve seen so far. The scale problems of mixing parts are shown here. I’m not especially bothered as I don’t think it’s a deal breaker but I know some people disagree. I hated the 2nd Edition Box Set Space Marines when I was a kid. Compared to the RT metal minis and the wonderful mix-n-match RTB01 they seemed lifeless and dull. But as unit fillers they are a pleasure to paint. 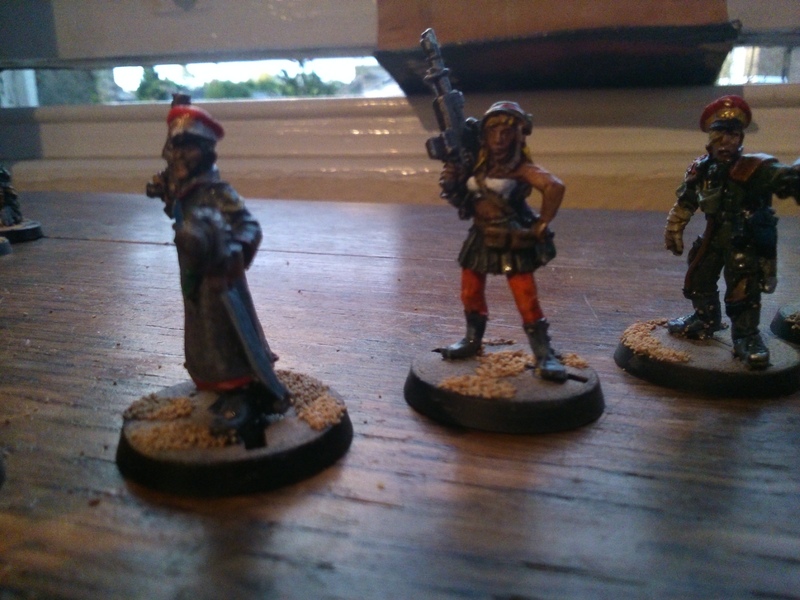 Next up is a unit of Imperial Guard. I’m more used to painting traitors and cultists, and found this lot hard work. 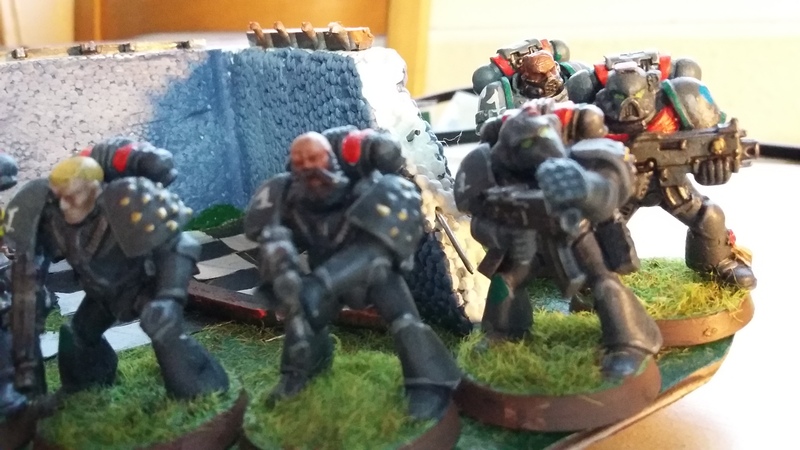 The unit consists of a standard bearer and his bodyguards, and 2 heavy weapons squads. 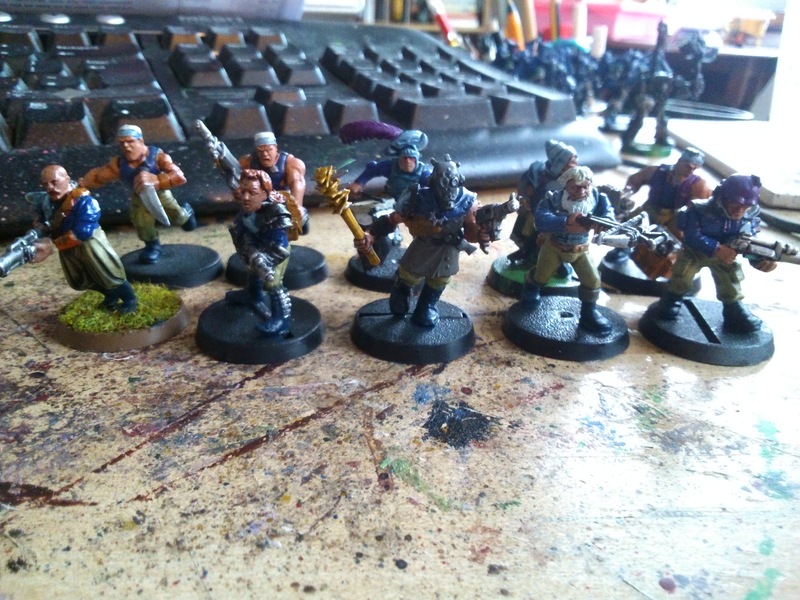 Mostly these are Rogue Trader models. 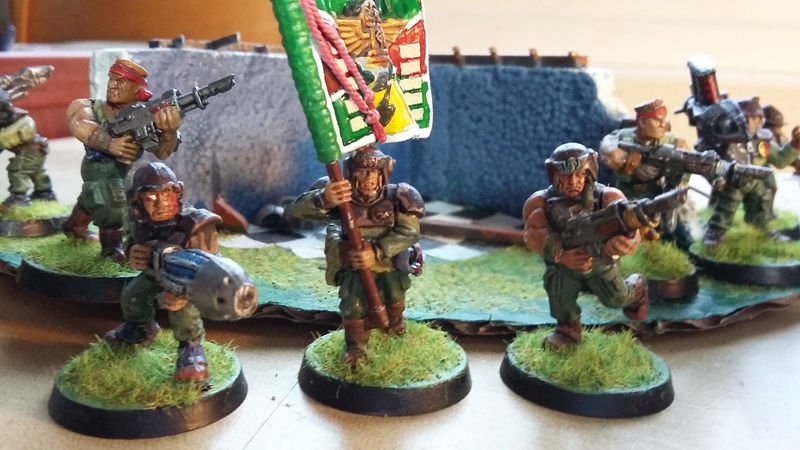 I am a huge fan of the RT plastic Guardsmen – though when I was a kid I thought the very boring. The injured guard is a great sculpt, a real pleasure to paint. 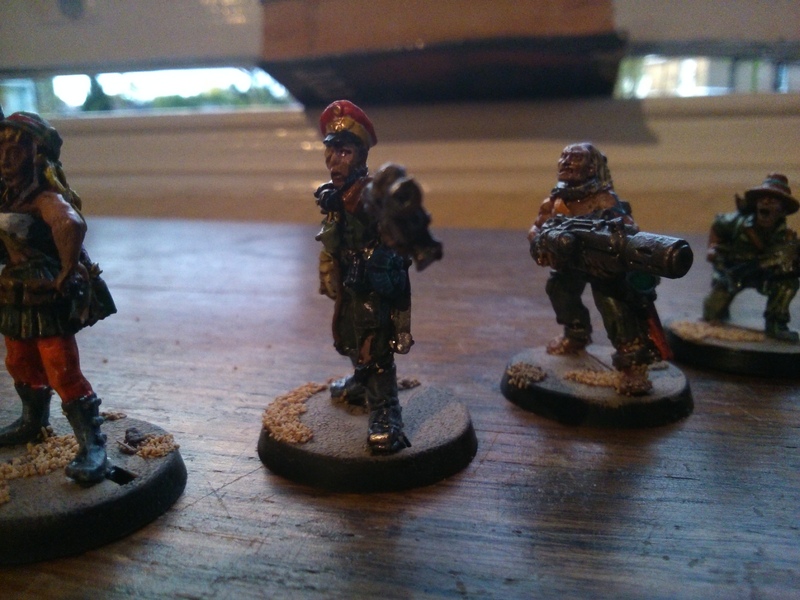 The guard with the plasma gun had damage to his face which I have tried to paint as a scar, with only limited success. 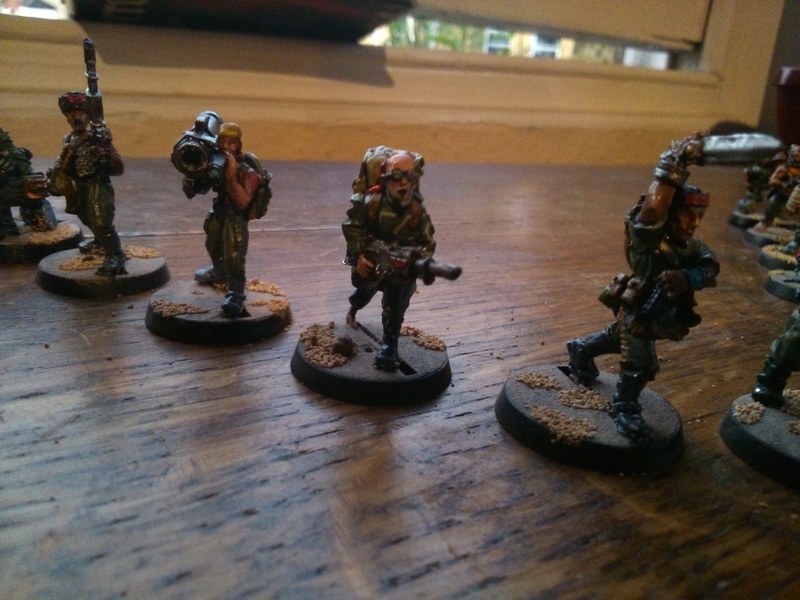 I hate painting eyes – the good eyes in this unit, on the missile launcher guard, were done by the original owners. When you’ve got a task and only the best will do! If no-one else can get their man and kill the baddies! etc etc. 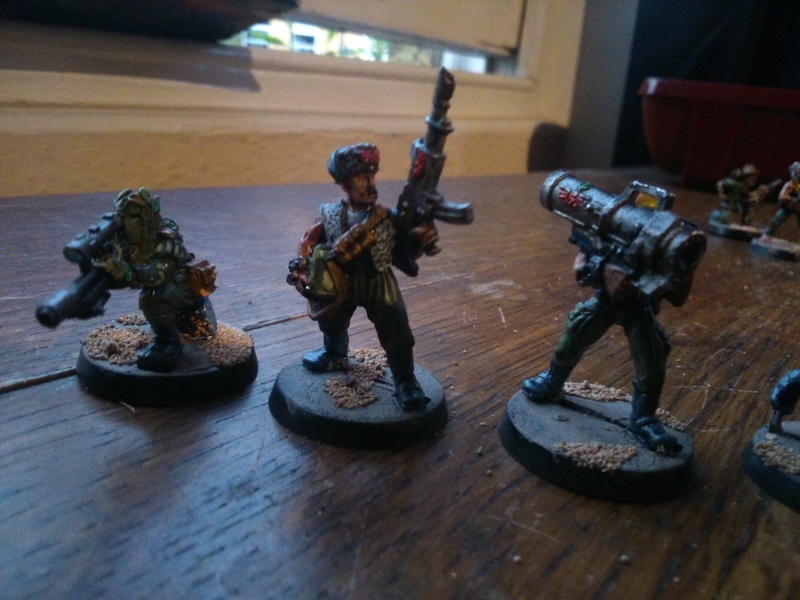 The last few weeks I have been painting up the Last Chancers. 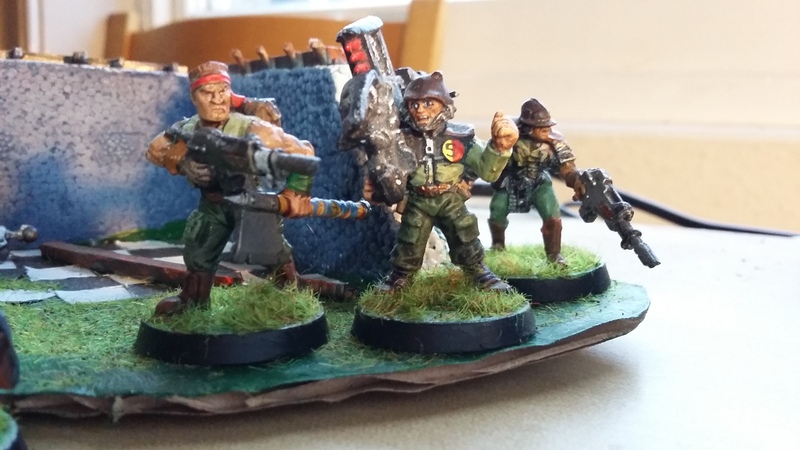 Col. Shaffer’s Last Chancers were a late 90s WH40k gang that allowed you to recreate movies like The Dirty Dozen, or play Action Force “GI Joe” with your armies. The idea was that this squad were hand picked by a tough old Colonel from a bunch of prisoners, picked because of their unique skills, and were offered the chance to embark on a suicide mission (or be executed). Each character isn’t really a character but an action movie cliche. Especially the two women, “Warrior Woman” and “Rocket Girl”. I guess being female is a character trait in Nottingham. I really enjoyed painting this lot. I put a lot into it, and whilst my critical eye sees now lots of things I could have done better, I’m still very pleased with them. Good evening and welcome to my Painting & Modelling blog. Rather than faff around with a proper introduction I think I’ll just dive straight in by picturing what I’ve got on my painting table right now. This bunch are part of my ongoing 40k Alpha Legion & Cultist army. This is a Chaos Cultist Squad. 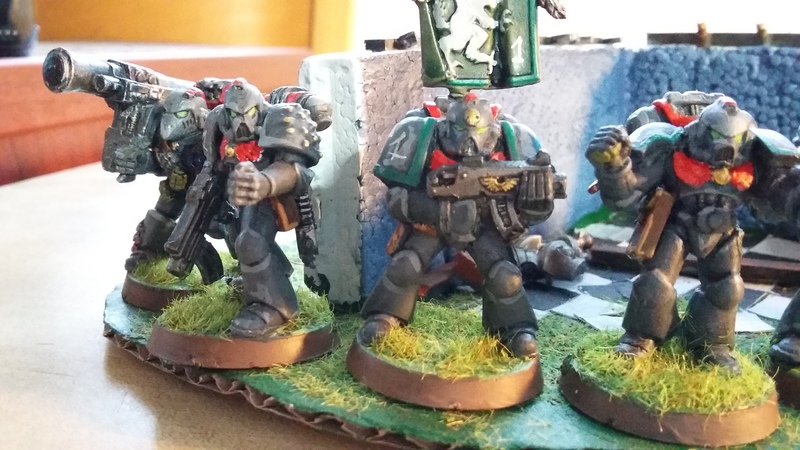 The Dark Vengeance chap in the middle is their squad leader. 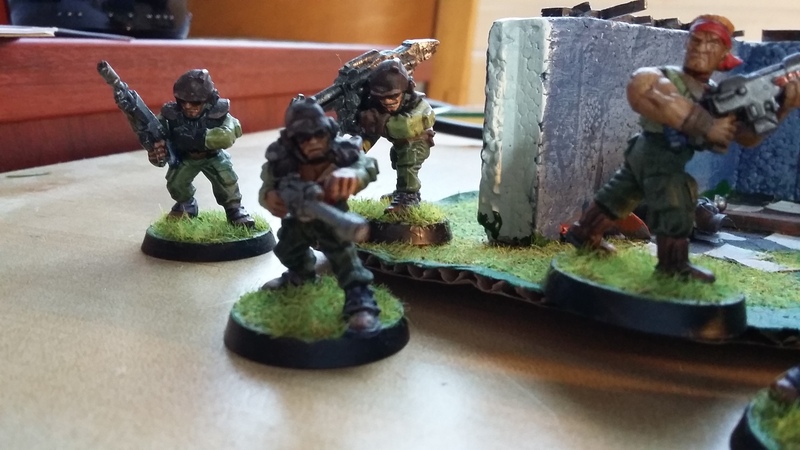 For Oldhammer fans, there’s an early metal guards(wo)man in the front row, and a plastic Imperial Guardsman too. The rest of the cultists are various ‘human’ figures from across different ranges. I like to use colours to tie in the cultists, assuming that they’ll be people from all parts of society getting tooled up and going off to fight for their dark masters. This lot are about 50% complete and you’ll see them again when they’re done! Cultists from across the ages!